如果你家里有人对花粉过敏， 或者养了宠物，需要空气净化器的话，可以看看Amazon上卖的这种采用 HEPA 过滤器的空气净化器 GermGuardian 3-in-1 Air Purifier with True HEPA Filter，现在打折后 for just $71.50 shipped (regularly $149.99). 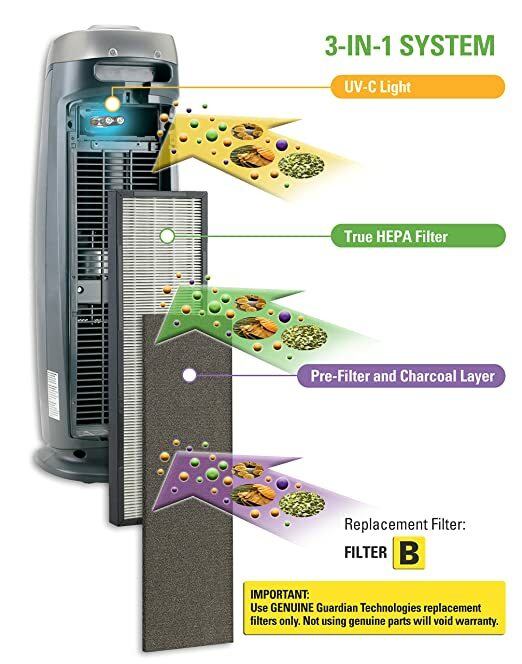 This air purifier features a True HEPA Filter that captures 99.97% of dust and allergens. The charcoal filter reduces odors from pets, smoking and cooking. Even better, this features UV-C light technology that works to kill airborne bacteria, viruses, germs and mold spores.